This month’s “Fresh From The Oven” challenge was to make a Stollen. Now I have to admit to reservations about this one. Not least that I don’t like marzipan, but I also knew things would be quite hectic on the run up to Christmas and that I would not have chance to get it done. Perhaps that’s why it is now 1 day before the FFTO deadline and I have only just started making it. To keep me on my toes I have decided to write the post as I go along. So here I am, mid project, with only a bit of dough left on my fingers as I type. Ooh – I have just seen that Jules posted a chocolate stollen that she made last year. I am loving the look of that, perhaps I will try that next year. I thought I had all the ingredients when I set out to bake this, but as usual there are a few bits missing. The dried fruit I have used is therefore quite a pretty mix of sultanas, pineapple, papaya, glacé ginger and cherries. Kneading the dough was ‘interesting’ as all the goo from the cherries and ginger kept oozing out and making it quite sticky, but I threw a bit of extra flour around to counteract that. 30 Minutes have already passed and the ball of dough is looking very similar to how it looked when I started so I am going to put it near the radiator and give it another half hour. I gave it an hour and it had risen a bit, but as is my wont I have decided to give it a bit of a knead and an extra proving session before I knock it back and shape it. Right – it puffed up a bit more that time so I rolled it out and we had a giggle rolling out the marzipan into a sausage. Rude minds and all that. We actually decided to reduce the quantity of marzipan down to about 5 or 6 oz as it seemed a bit much for our anti marzipan attitude. I just had contact via Twitter with Jules who is very organised and has already scheduled the posting of her blog. The loaf is shaped and proving again now whilst I get the turkey and bubble n squeak sorted for tea and watch the end of Home Alone, then it can go in the oven. It’s in… It seems to be browning up quite quick so I have turned it down to 165 degrees. I have just realised, to my disdain, that the usual supply of spirits that Ed gets given for Christmas does NOT CONTAIN ANY BRANDY OR RUM! How inconsiderate! Lots of wine and whisky, but this year no rum or brandy. We usually don’t buy anything in as we wait until the sub-contractor fairies arrive. So in my own special way I have made some rum by mixing a sploosh of whisky and a dash of sherry. The oven is a beeping, so whilst the Monopoly board is set up for the 2nd night running, so that George can wup us again, I shall go and anoint the stollen with butter and home made rum. I gave it it’s final 5 minutes upside down with some foil over the ends to stop them browning too much. Still not tasted it yet, but it’s done. Stop the Clock, run upstairs to take a quick photo and publish that blogpost. 5. Preheat the oven to 180C/365F/Gas 4. 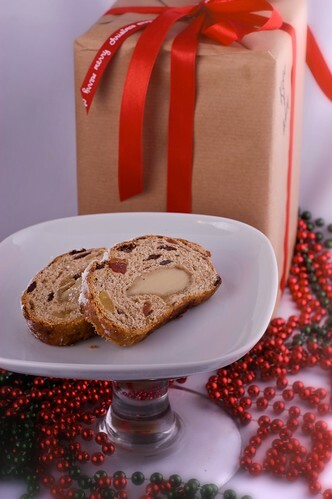 Place the stollen on the baking tray into the oven to bake for 40 minutes, or until golden-brown and cooked through. Well done on getting the challenge done in time. The picture of Ed picking out the fruit made me laugh. 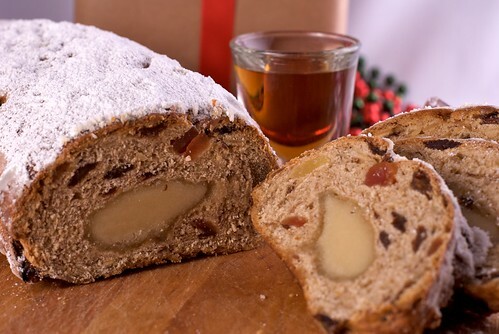 Your stollen looks great and I know mine tasted fab. Mmm looks lovely and I doooo like marzipan! Deliberating whether to do FFTO myself in new year. Oh how your post has made me laugh! You and I are two peas in a pod. I thought I was very organised by making it yesterday – do people actually have the chance to make things earlier?!?!? !